Über literally translates from the German as over or above and, in the context of this book is related to Übermensch from Nietzsche’s Zarathustra. When you combine Über with mensch, then the word delivers a new meaning: superman, overman, or above human. It is a philosophical concept embroiled in the upholding or emerging high morality, especially in the absence of faith or development of nihilism. It is a word that challenges the human race to be better, to become something superior. This is a befitting introduction to the book if you consider the backdrop of the Second World War. When I met Kieron Gillen I was taken aback at his passion for writing and how engaging he was with his readers. He is clearly a very intelligent man who has so much to convey and with the excesses writes two-page commentary regarding each issue and his creative process. Kieron has rapidly become a stalwart at Marvel with credits on Uncanny X-Men, Young Avengers, Iron Man and my personal love, Journey into Mystery. These books present a variety of situational and storytelling strategies and focus on the individual as well as the team. 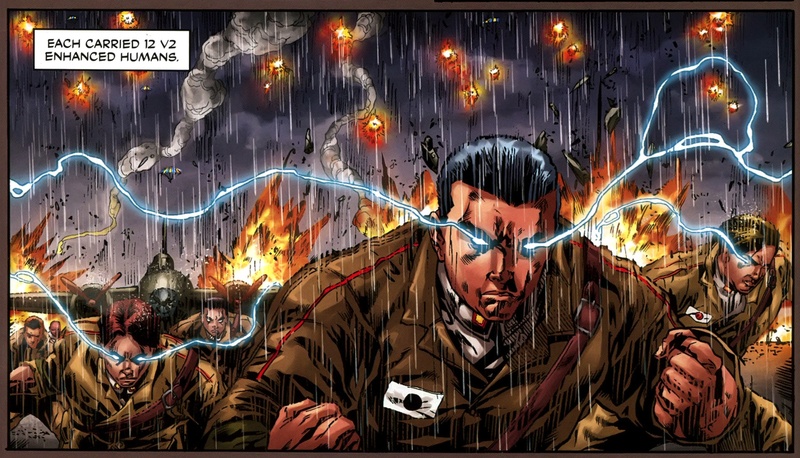 Über is an independent project focused on the development of super soldiers during the Second World War and Caanan White provides the artwork for this push over the frontline. This comic brings about the second arc after the gruesome battle of Paris. We move from the battle between Britain and Germany, to the US in Okinawa, Japan where we are embroiled in the Pacific Theatre of Operations. The level of detail and research that has gone into this book is very impressive as it serves as an accurate piece of historical fiction. A third person narrative takes us on a journey into the tactics of the Kamikaze and the juxtaposition of sacrificing air fleet to heavy artillery laden battleships. It allows for some breath taking battle sequences from Caanan who draws the most wonderfully fluid waves and discernable clouds. If you factor in smoke, gunshots and artillery fire then you can imagine a devastatingly picturesque panel. 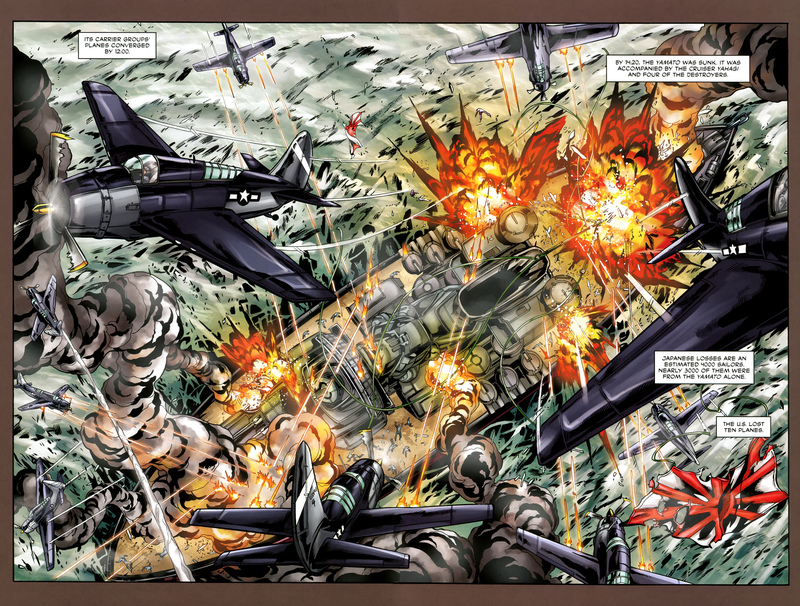 Michael Dipascale and Keith Williams provide heavy intense inking and deep shadings of colour, which emphasise the impact of each blow. However I find that this effect is overladen when used for straightforward interpersonal dialogue, especially considering how subtly fragile our soldiers are actually portrayed. The call to action once again brings out the horrors of war and the blue lightning effects in the midst of dark whispering rain, once again showcasing the exceptional complexity of White’s artwork. This is not a book for the faint at heart. Gillen’s writing is suitability balanced between narrative composition and the conflicting thought processes of our characters. He sets the scene through simple chronicling boxes amongst the epic devastation of Caanan’s art but then brings wonderfully idiosyncratic dialogue at the ground level. Examples of this include the ludicrous boxes to tick for joining the kamikaze and the US soldier referring to army actions as sexual escapades. There may not be a central protagonist to champion or set our expectations on, but the atmosphere of the book is its rare gift in the comic world. There is an air of pessimism and desperation as we witness both sides struggling to keep themselves mentally durable as they carry out acts of obscenity. It is a mindset that is incredible hard to empathise with, let alone convey in a comic book. On top of this gritty realism, Gillen then attempts to insert a fantastical element of superpowers. In order for this book to remain free from the optimistic single sided viewpoints portrayed with Captain America, it has to remain true to the war. Gillen calls these upgraded tank-men, the panzermensch, but they are not treated as rays of hope in a partisan war but just another weapon. There is no propaganda sensationalisation but espionage and ensconce, which is why there is no central character. It is a cruel and catastrophic war and the Übermensch are just another part of it, which is how the book maintains its integrity. Superman is no superhero, he is just another man bred as a devastating weapon to kill more enemy soldiers. It is a disturbing and out of countenance to all that we know in the world of mainstream superhero comics, but so unique and refreshing. This is an exceptional book, which is so enthralling to read as it captures the loss of life and mentality of its warring factions. Previous PostThe Theatre List 2/10 – Lights Out but Im still reading my comics!